MOQ:300 meters each color/design . It`s unique patented process employs high-pressure water jets to force the recycled leather fibres through an integral textile reinforcement core. It`s a process that has major environmental advantages over conventional bonded leather, as it uses no chemicals (no adhesives, no resins ).Its process is a continuous closed-looped system with 95% of water recycled. It is a clean technology product using sustainable natural leather fibers and 100% zero carbon electricity in its production process. Step 1: The Base Materials of ELFA leather is leather shavings and trimmings. Step 2: Leather shavings and trimmings undergo a fiberisation process which shreds and upgrades them into fine usable fibres . Step 3: Leather fibers are formed into two layers on both sides of a micro textile core.They are fastened with high pressure water jets rather than chemical adhesives. Step 4： After color impergnation ,a pu finish coats the leather and a release paper template gives the surface a leather effect grain. Step 5: After final inspection and quality assurance it is ready to be rolled . On a roll the leather is more functional to use and will produce less cuttings and wastages in the further use . Traditional leather is being rivalled by manmade alternatives. The latest in this new generation is composition leather. Composition leather comes in numerous forms. Most rely on adhesives and resins to bond the leather fibres together to form the material. 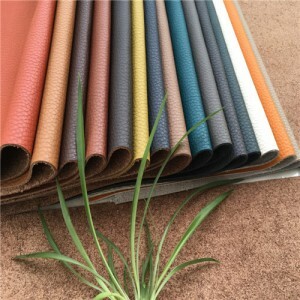 However, composition leather from ELFA leather is different. The ELFA leather patented process uses no chemicals and resins whatsoever but just water alone. 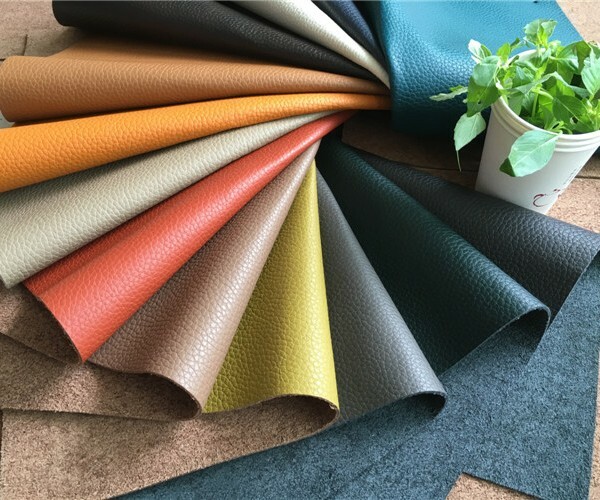 With its strong eco credentials, high performance and low cutting wastage, composition leather from Junhua leather is fast becoming the material of choice for the footwear, leather goods, upholstery and transport sectors. Why use composition leather as an alternative to traditional leather? …the remainder….¾ of the tonne is waste. Trimmings and shavings (the raw material of composition leather) accounts for around 30% of a tannery’s waste. thanks to an easy to keep clean pu coating. pigmented for a consistent flawless color. Can be fairly rigid limiting applications More flexible and easier to sew. Needed to continually look good. Composition leather outperforms traditional leather in several key areas. 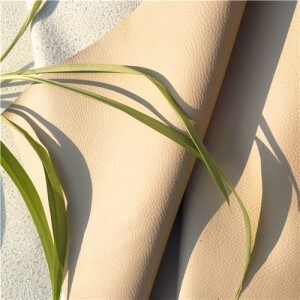 Compared with Traditional Leather hides , price is more competitive . 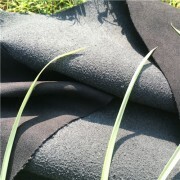 Made from discarded wet blue leather off-cuts that normally end up in landfill ,together with high pressure water jets to force the natural leather fibers through an integral textile reinformancement core.It is a clean eco-friendly material ,no chemicals (no adhesives ,no resins), what`s more ,to reduce the pollution of wet blue leather hides` cuttings and trimmings to environment. Excellent flame retardancy endorsed by British and European fire and safety standards. Manufactured from leather fibres so unlike leather hides has no natural defects and results in minimal batch-to-batch variation for a flawless finish. Bespoke colours are available plus various grains and the ability to emboss with company or brand logos. Up to 50% lighter than traditional leather, composition leather is critical in helping transport applications to lower emissions, fuel consumption and reduce their carbon footprint. 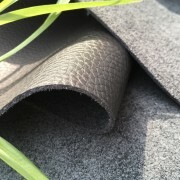 Composition leather`s reinforced textile core enables the leather to resist tearing and gives it greater elasticity. Ideal for heavy use applications from passenger seating to handbags and wallets. Simply wipes clean with a dampened cloth, thereby avoiding the need for costly cleaning products and maintenance. To reduce the killing of animals ,conforming to the policy of Animal Protection Countries and Organization. Made from recycled leather off-cuts, it`s the best performing, eco-friendly and economical alternative to leather on the market today. And unsurprisingly, its use is widespread and growing. Driving its worldwide success is pioneer and leading expert in the field JUNHUA leather. The company operates from its production plant in Peterborough UK, where it exports its Products to Europe, United States, China, Taiwan, India, and internationally.Leading international brands and companies use composition leather from ELFA Leather . Its groundbreaking recycled leather alternative has already found its way into the interior upholstery of major airline fleets, and many bus and coach operators. The unique material has been adopted by leading retail brands for footwear, as well as establishing itself as the eco-friendly material of choice for leather goods and both domestic and commercial upholstery. ELFA Leather ECOLOGICALLY SOUND clean tech manufactureEvery part of ELFA Leather`s production is set out to minimise resources. From sustainable sourcing through to closed loop manufacturing and waste reduction during cut and sew operations. ELFA Leather`s unique patented process employs high-pressure water jets to force the recycled leather fibres through an integral textile reinforcement core.It`s a process that has major environmental advantages over conventional bonded leather, as it uses no chemicals. Its process is a continuous closed-looped system with 95% of water recycled. 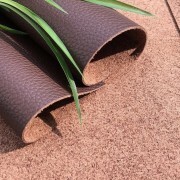 ELFA Leather is available to cut from a roll 1.4m wide (55"), significantly saving on wastage compared to hides. With its automated stack cutting ELFA Leather also provides faster processing with up to 90% cutting yields. ELFA Leather allows for bespoke production. Its methods are able to be adapted to the specific performance requirements of each industry sector and the precise user application: whether it is hand sewing by highly skilled operatives, computer controlled multi-layer cutting or highly automated manufacture. The leather industry as a whole is responsible for generating huge amounts of waste as a by-product of its production. Take a tonne weight of hide, for instance, used to produce traditional leather.One ton generates up to 255kg of finished, tanned leather but almost three-quarters of a tonne is classed as waste. Meanwhile, harmful oil-based chemicals are used in the creation of bonded leather. However there is a corner of the industry that is geared to forging a more ecologically responsible method of leather production at every stage. 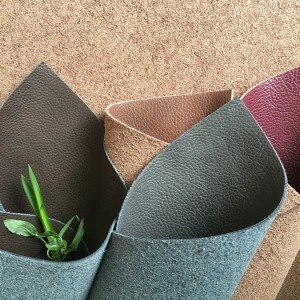 A leading supplier of composition leather, ELFA Leather , has pioneered an environmentally friendly leather fibre material that has already made its way into many everyday products and applications, from airline seats to shoes. It takes off-cuts, shavings and trimmings, which are usually discarded by tanneries and would otherwise go to landfill, and recycles them to make its composition leather, ELFA Leather. Another crucial difference between these methods and those employed by manufacturers of conventional bonded leather is that no chemicals are used whatsoever in the process of bonding the leather fibres together to form a sheet of material. Just use water alone. Using a high-pressure water jet process has major environmental advantages. The supplier`s carbon footprint is dramatically reduced as a result because there are no oil-based adhesives present in the process. 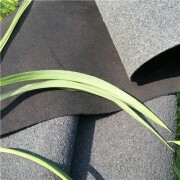 ELFA Leather, for instance, produces no harmful wastewaters in the manufacture of its composition leather. Their process is a continuous closed-looped system, with 95% of all water produced used in production being recycled. In addition, product emissions at the ELFA Leather,plant in the form of solvents are thermally oxidated and the energy generated fed back into the manufacturing process. 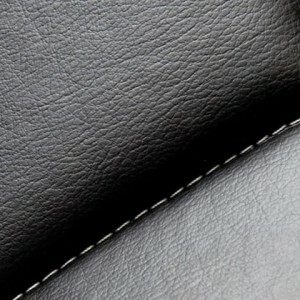 Its thermal oxidiser has cut natural gas use by between 50-70%.What all of this means for many leading companies is that the production methods of composition leather manufacturers such as ELFA Leather are able to be perfectly aligned with their own eco initiatives in cutting waste and reducing their carbon footprint. Composition leather makes shoes lighter than traditional leather, allowing greater freedom of movement for the wearer, particularly for those engaging in sports. Packing: in double plastic bags of 25 meters each roll . Application: Domestic Upholstery ,Home sofa furniture. 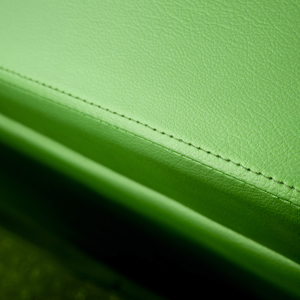 Composition leather is leading the way in greener air travel. Composition leather has the same aesthetics and feel as traditional leather. But more than just that, its incredible lightweight properties lead to lower fuel consumption. One of the reasons why the world’s airlines are adopting it for the seat and interior finishes of their planes in a bid to reduce their carbon emissions. 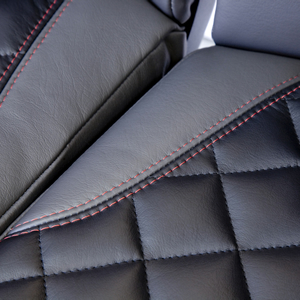 Many a luxury car model is defined by the sleek look and comfortable feel of leather trim. But the luxury of traditional leather adds a significant cost for the buyer. However, times have changed and now a revolution in leather is making this option a whole lot more affordable. Composition leather from ELFA leather is unique. It has the same look and feel as traditional leather but for less outlay. It is a popular material that a lot of clients use it to reply traditional leather for avaition ,cars ,upholstery ,footwear and leather goods. Because it is very strong and durable . Use year is longer than genuine leather .